Update: Reuters is now piggybacking on the previous report from Bloomberg, with the news that South Korea’s justice ministry said on Thursday it was preparing a bill to ban cryptocurrency trading through its exchanges. "There are great concerns regarding virtual currencies and justice ministry is basically preparing a bill to ban cryptocurrency trading through exchanges,” said Park Sang-ki at a press conference, according to the ministry’s press office. He added that he cannot disclose details about the proposed shutdown of virtual currency exchanges but will jointly work with the government task force. While the earlier report from Bloomberg that South Korea is preparing a Crypto-exchange shutdown bill has yet to be confirmed, moments ago Reuters reported that in the latest crackdown against thr frothy sector, South Korea’s largest cryptocurrency exchanges, including Bithumb and Coinone, were raided by police and tax agencies this week for alleged tax evasion. An official at Coinone, one of the country's largest crypto exchanges, told Reuters that "a few officials from the National Tax Service raided our office this week." He added that "local police also have been investigating our company since last year, they think what we do is gambling,” said the official, who spoke on condition of anonymity. He said Coinone was cooperating with the investigation. On Wednesday tax authorities also raided, Bithumb, the second largest virtual currency operator in South Korea. To be sure, this is not the first time the South Korean government has cracked down on potential money-laundering and tax evasion. Authorities previously said they are inspecting six local banks that offer virtual currency accounts to institutions, amid concerns the increasing use of such assets could lead to a surge in crime. 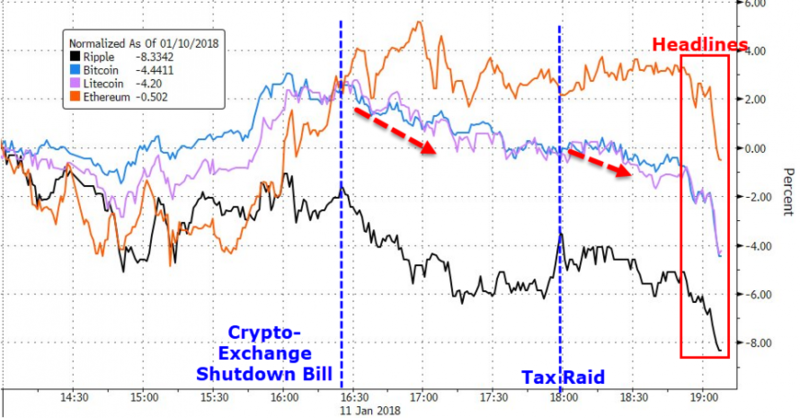 Two weeks ago, the entire sector plunged following news that South Korea would require cryptocurrency transactions to name participants and ban banks from offering virtual accounts, and that the government may also direct law enforcement officials to close some exchanges. As a result of Bitcoin’s record surge last year, demand for cryptocurrency in South Korea has exploded, drawing college students to housewives and sparking concerns about a gambling addiction. We profiled the plight of the nation's bitcoin trading addicts in "A Stunning Look Inside The World Of South Korea's "Bitcoin Zombies". 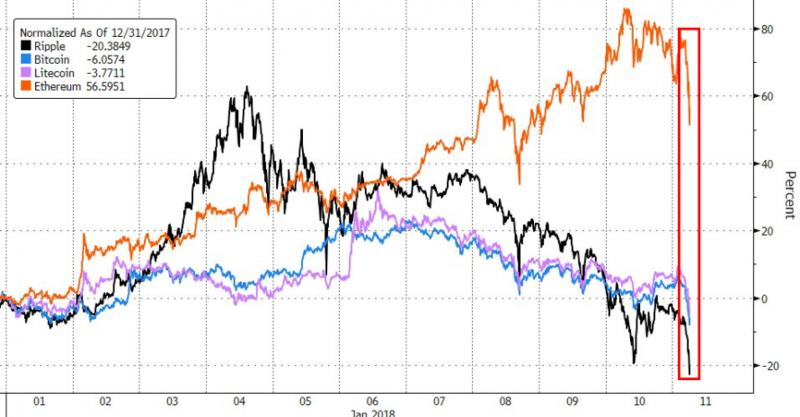 For now, the double whammy of news out of South Korea has had a modest impact on cryptocurrency prices, but nowhere near the 40% plunge observed two weeks ago.